For weeks now, I have been looking for a container to gather the small victories my colleagues and I celebrate in the office. For a couple years we have been writing down small successes on pieces of paper and dropping them into an oversized champagne glass in the office. But we lost our over-sized champagne glass at the end of January when it fell and smashed on the floor. It was a sad day, but you can’t be deterred by that kind of loss—not if you value celebrating the successes of a team. You have to gather the small victories that were inside the glass and look for a new container. Initially I thought I would get another over-sized champagne glass, but the only one I could find was available online at a price I wasn’t willing to pay. I went to several stores—and may have dragged one of my sisters and her children and mine to a store in New York in a drenching rain just for this purpose—but still came up empty-handed. My uncle (and godfather) suggested that I might find something that already had a story behind it, and I liked that idea. 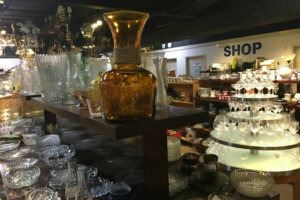 But when I went antiquing, I realized that I was out of my league price-wise. I didn’t need something that was a treasured heirloom, just something that had a bit of a past. And I didn’t need to know what that past was. So I headed to the Habitat for Humanity Restore. I walked into the housewares section, and there it was. It was unlike anything I had considered during my search. I wasn’t sure it was attractive. But it was useful. It was solid. It was unlikely to tip without some effort, and if it did fall, it might actually survive. I could fit my hand through the neck so that toward the end of the year we could reach in and pull out the victories and read them aloud. This was no elegant champagne glass. But it was built to last. Somehow that seemed just right for the successor of the small victory glass. Besides, one of my colleagues who is talented in graphic design is sure to want to make a “Small Victory Jar” label for it. The price? A mere $4. I carried it around for a while and looked at the other options. 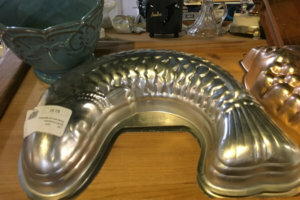 But everything else seemed rather ordinary and mundane—except for the fish-shaped pan that I regret not buying. But I wasn’t there to purchase a fish pan. I was there to find a container for our small victories. And sometimes walking out of a store without a fish-shaped pan is a small victory in and of itself. I don’t know its story, but I imagine that its first owner loved it. Or maybe it was that wedding gift that the newlyweds didn’t really love, but they thought of the giver every time they looked at it or used it. Whatever its story was, the Small Victory Jar has a new chapter now. And I can’t wait to see it full to the brim.